Dawn Fairbanks, Processing and Serials Specialist by day, opera singer by night, grew up in rural New Jersey, singing in school choruses. Her love of music drew her to the French horn, an instrument that she took up at the age of 9 and played through college. Dawn’s interest in artistic forms found other outlets during her time at Susquehanna University in central Pennsylvania. Since childhood, Dawn recalls that she was “always scribbling in notebooks and writing stories.” Her love of writing drew her to pursing a BA in Creative Writing and then attending graduate school at the University of Wisconsin, where she received her MA in English Literature. After finishing her Master’s program, Dawn relocated to Vermont, attracted by the natural beauty of the state, the snow, and the bucolic setting that reminded her of the area where she was raised. While there, she began singing in a church choir, where she met the leader of the local Gilbert & Sullivan troupe, who invited her to perform in an upcoming production of Princess Ida. Dawn performed the role of Lady Psyche, Professor of Humanities, in this comic opera with a ‘war of the sexes’ theme. As Dawn recalls “it was the most fun I’d ever had.” After that, she was hooked. She continued to sing with the Gilbert & Sullivan troupe after this first performance, and also sang with the Green Mountain Opera Festival for the next four years, before moving to the DC area with her family. Although Dawn had tapped into a newfound love of singing, her daughter Chloe gave her the push she needed to take this interest to the next level, encouraging her to sign up for formal instruction. Dawn began working in a vocal studio and taking lessons. She is now part of the American Center for Puccini Studies (ACPS), an organization that performs works by composer Giacomo Puccini, offers educational opportunities for singers, and provides community outreach and service. “There is always something in the works!” Dawn explains, as she mentions that she is wrapping up a 6 week aria workshop. 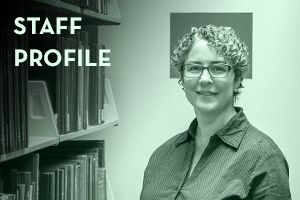 In addition to gigs with ACPS, she continues to sing in her church choir, enjoys taking in local performances, works here in the Library, and finds time for her family. Music is a big part of family life for Dawn. The whole family sang together with the Gilbert & Sullivan troupe their last year in Vermont, her husband has participated in local theater, her younger daughter helps broaden her musical tastes by making playlists for the car, and Chloe, who nudged Dawn into pursuing her passion for opera, is now a performer in her own right. Dawn proudly shares that the 21 year old AU student just sang lead in the Gilbert & Sullivan Society at Oxford University. Dawn also has excellent advice for any AU students interested in seeing local performances or getting into opera. Aside from the “huge, huge CD collection and excellent opera selection” at the AU Music Library, she suggests looking for smaller regional venues, which often have reasonably priced tickets, such as the ‘Music at Redeemer Series’ at the Episcopal Church of the Redeemer in Bethesda. She also recommends checking out local venues that offer special student pricing, like the Kennedy Center’s ‘Specially Priced Tickets,’ and DC area groups, like the Inscape Chamber Orchestra, made up of “local, young, insanely talented performers.” On a different note, Dawn’s younger daughter Mollie, whose passion has become human rights, highly recommends the Library’s free Exploring Social Justice series, which features speakers who have had personal and profound experiences with injustice and have demonstrated the capacity to forgive and to live the rest of their lives committed to witness and advocate within their spheres of influence. From the Met website: "Jokes, misunderstandings, and gender-bending disguises—including knights dressed as nuns— abound in this hilarious tale of deception and seduction." There's a wonderful scene with the three stars all in bed together....perfect for anyone who thinks opera is stuffy! Aaaaaand...more seduction! What is it with opera?! The themes are familiar to all - jealousy, attraction, and a boss who has all the fun while leaving you underpaid and unappreciated - all set to Mozart's sublime music.